Computer training started in April 2010 The computer training for students of the Gokhale Children's Academy has been started in April 2010. It is planned to provide computer education from the 5th class on. Using Montessori material at Gokhale After a broad training teachers and students are now in the position to work with Montessori material. Students demonstrated great interest for this new method and were able to solve even challenging tasks. 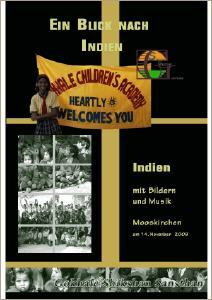 Presentation in Mooskirchen on November 18th 2009 Get a short view of India with pictures and music. A short overview of some facts of India will be presented first. Music and videos of Indian dances are part of the programme. Indian food and tea are served as well.